Hi Guys! How are you all?? 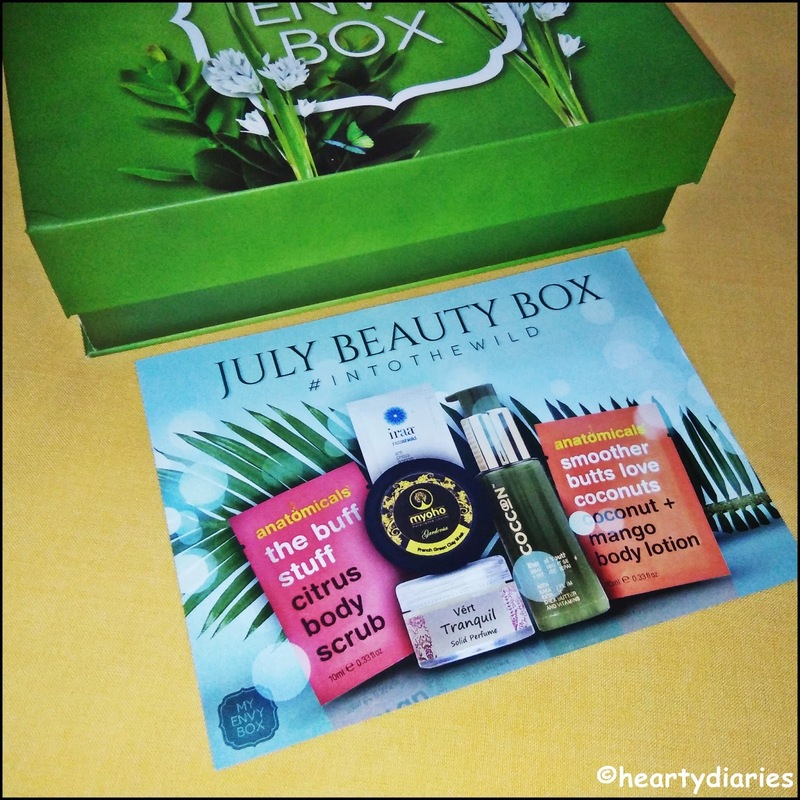 We all love subscription boxes, don’t we? Why wouldn’t we? They’re a bunch of happiness and surprises and have things we want to buy but cannot spend huge sum of money on them. Subscription boxes give us products that help us pamper ourselves and a box that contains luxury beauty products is always every girl’s favorite! 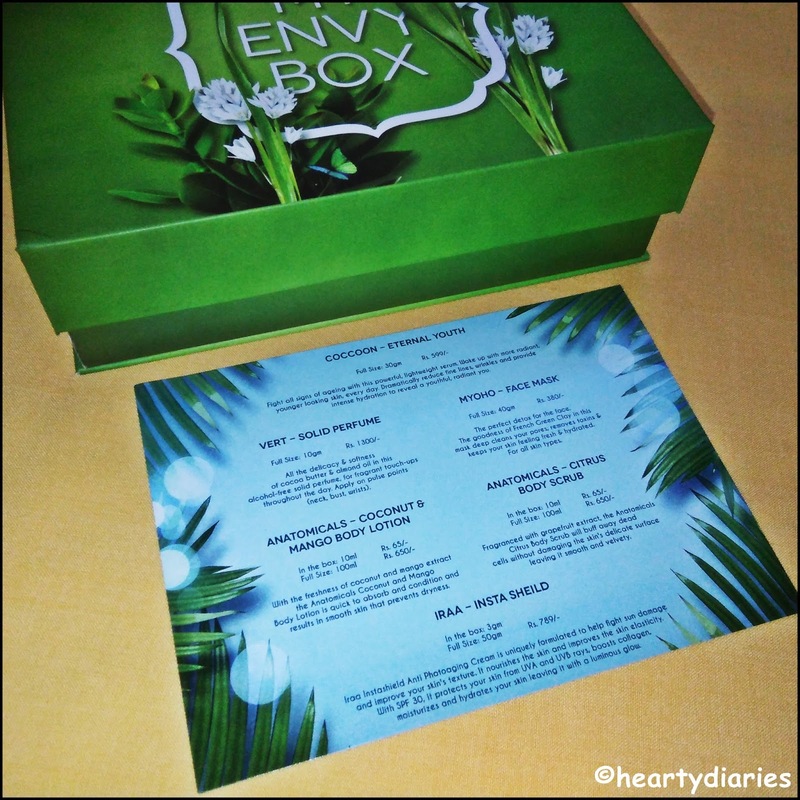 Today I am here to unbox my MY ENVY BOX for the month of July 2017 with you all and share my review and first impressions about the box and the products inside. Even though I’ve got the box a little late, the company ships it around 14-15th of each month. 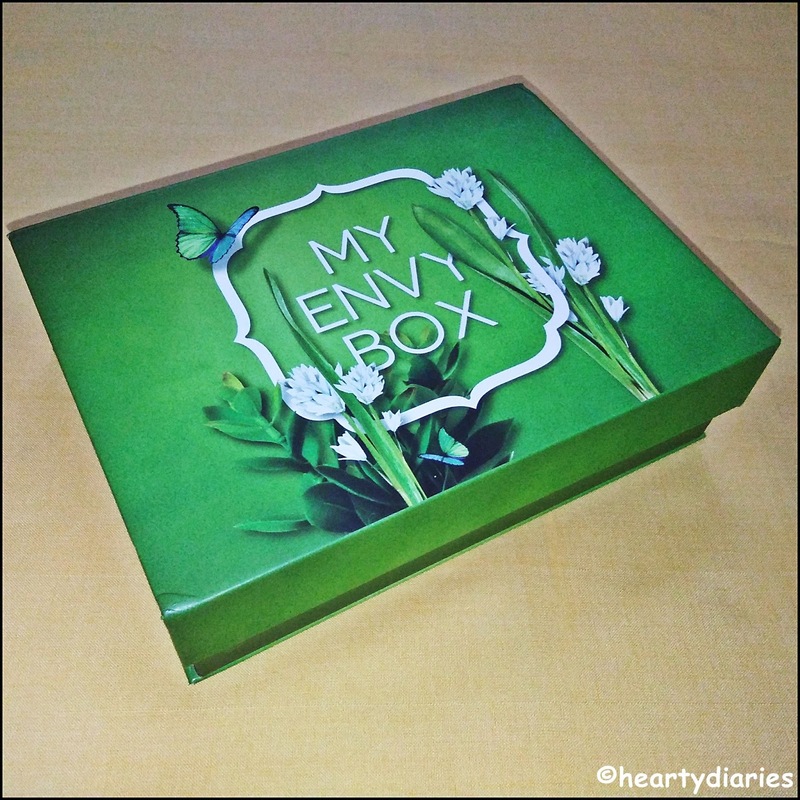 My Envy Box is not unknown to anyone today as it is quite old and renowned in this field. 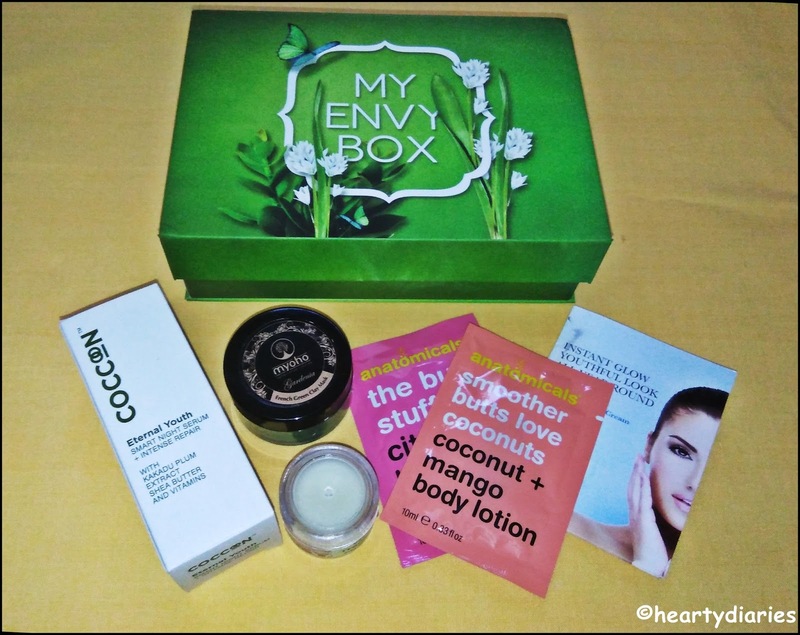 It is one of the best subscription boxes out there and has a word of trust and quality with it since August 2013. Long time, no? Old is gold!! For those who don’t know much about this box, let me tell you guys! 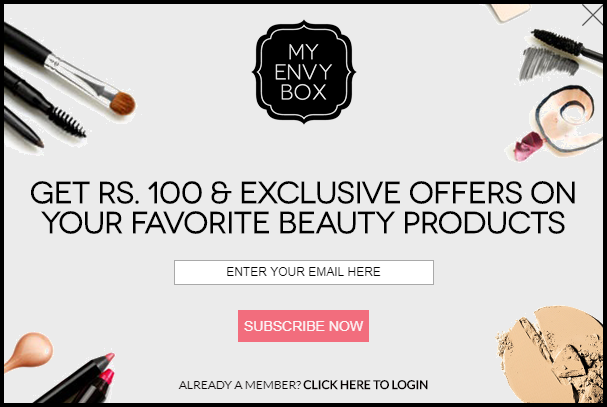 My Envy Box is a leading discovery commerce platform and they are redefining the retail process by offering consumers a unique and personalized way to discover, learn about, and shop for the best beauty, grooming, and lifestyle products on the market. 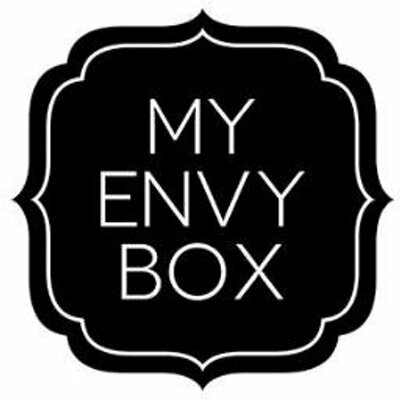 They also have a generous loyalty program that rewards you every time you shop, refer friends, and give feedback on your monthly samples at feedback@myenvybox.com.. You can redeem Envy Points and save on all orders on the online boutique. I really really love earning points and buying stuff from that money! It gives me happiness which I cannot describe! Well I know I blabbered a lot. Without further ado, lets just jump in to the main things you wanna know..
First go to www.myenvybox.com! A dialogue box appears that asks you to subscribe to them via your email and in return, you can avail Rs. 100 discount as well as some exclusive offers on your favorite beauty products.. I have already subscribed to them..
Next, you see the homepage where you get to see a blink of July edition of Beauty Box! 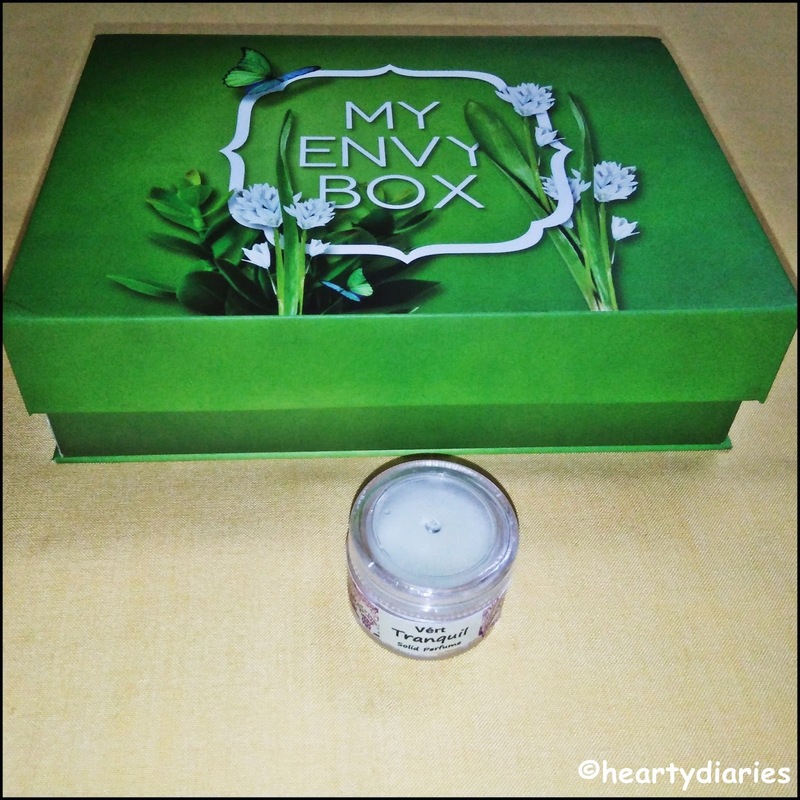 Today I am sharing my review about the Beauty Box! Lets just check their subscription plans where the shipping charge is free but COD charge is Rs. 50. Wow! Wasn’t that great? 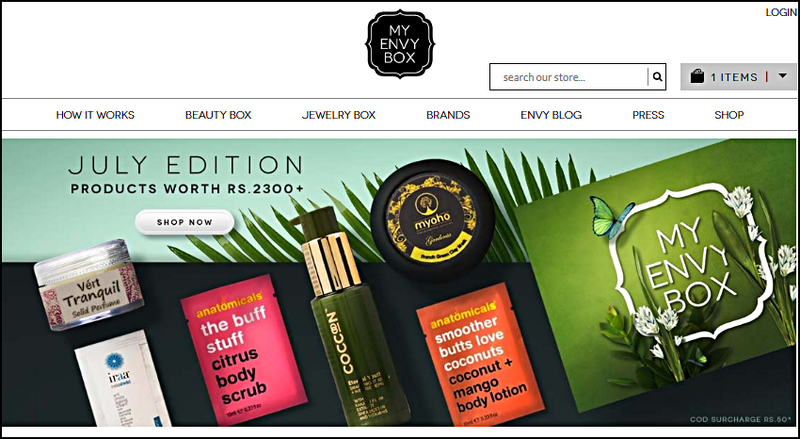 Let me also tell you that for one month subscription box, you earn 213 Envy Points where 1 Envy Point = 1 Rupee. Similarly, you earn 557 Envy Points for three months subscription.. I am leaving buy links for you guys in case you’re interested in buying the July 2017 Box.. They’re not affiliate, giving them just for your help! 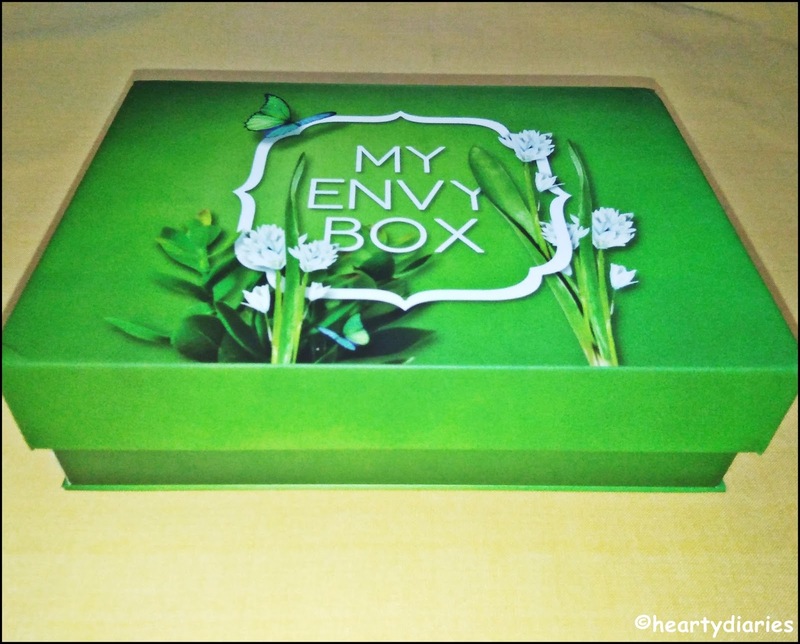 The box came in a white cardboard box having exactly the same size to keep the Envy Box safe and secure. Coming to the actual box, the quality is amazing. 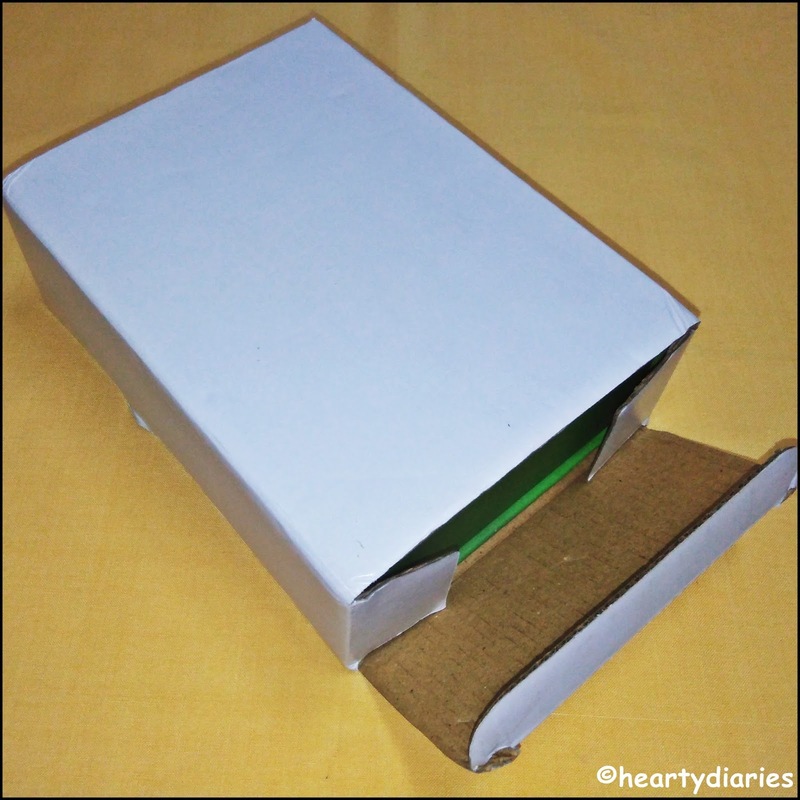 It is made up of good quality, thick cardboard, has a nice packaging, beautiful detailing and the best of all, it has a magnetic lock which is really sturdy and enough to keep the box safe from mishandling. I’m definitely gonna reuse this box because its so classy and pretty!! When I opened the box, there was a card at the top which has a beautiful picture of all the products inside and at the back side, has the cost and description of products mentioned.. The box is smaller than what I expected, yet big enough to hold the contents properly. Actually its a good thing because if the box was bigger, (which I’ve seen in other boxes) the products would move in here and there causing breakage or mess. The products are well arranged and wrapped in hay. I don’t mind having hay, quilling paper or bubble wrap inside until and unless my products are safe. 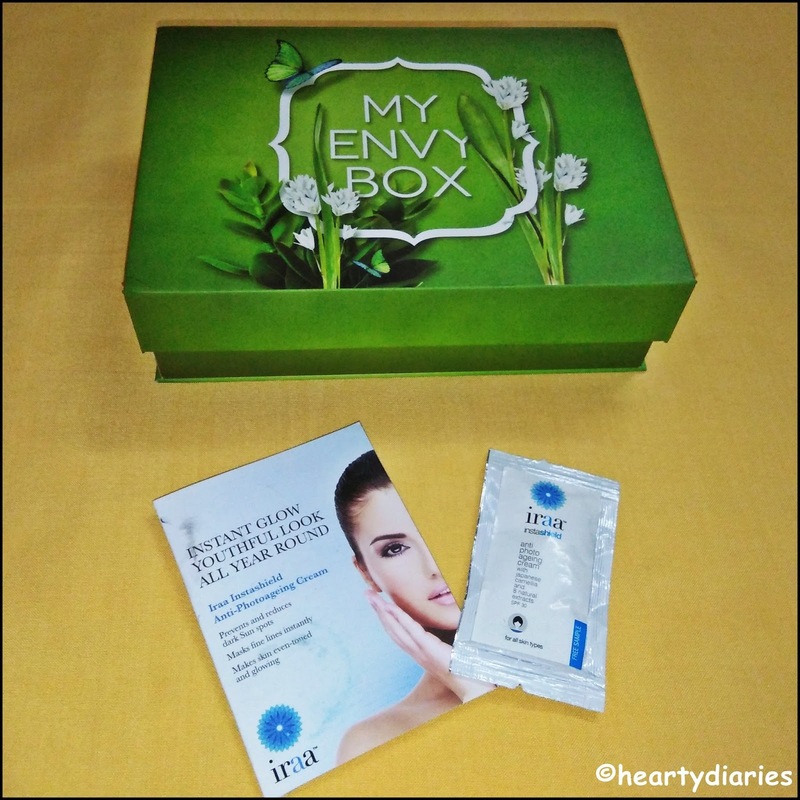 This month the box has six products out of which three are full sized and three are sample sized products. My thoughts: With this kind of an amazing description and high claims, my expectations also turn higher. I am going to give this serum to my mum and see what happens. I really wish it works and I hope it will. Coming to the product appearance, I really love it. It looks really classy because of the golden detailing and has a cute shape. I really love its overall packaging and highly prefer products with a pump as its more hygienic. This serum is dermatologically tested and is paraben free which makes me even more excited to let mum try it out. Its little pricey but I hope its worth it! 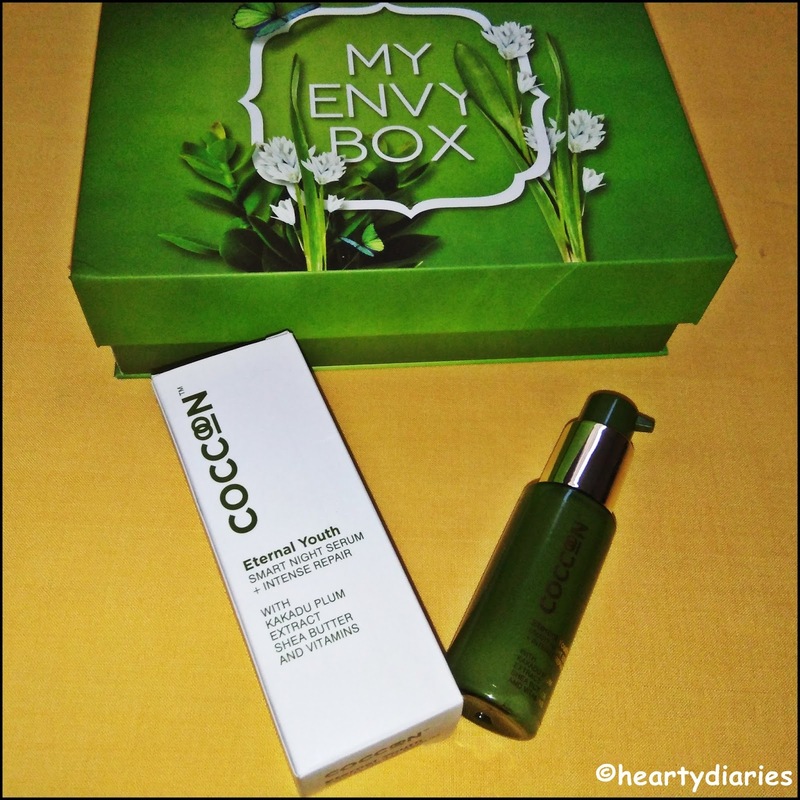 My thoughts: Alcohol free perfume that too worth Rs. 1300!! Wow!! I am new to this solid perfume idea and would love to use it. It is going to last really long I hope! Lets see.. This perfume has a creamy texture like vasaline but I cannot recall what its fragrance is like. 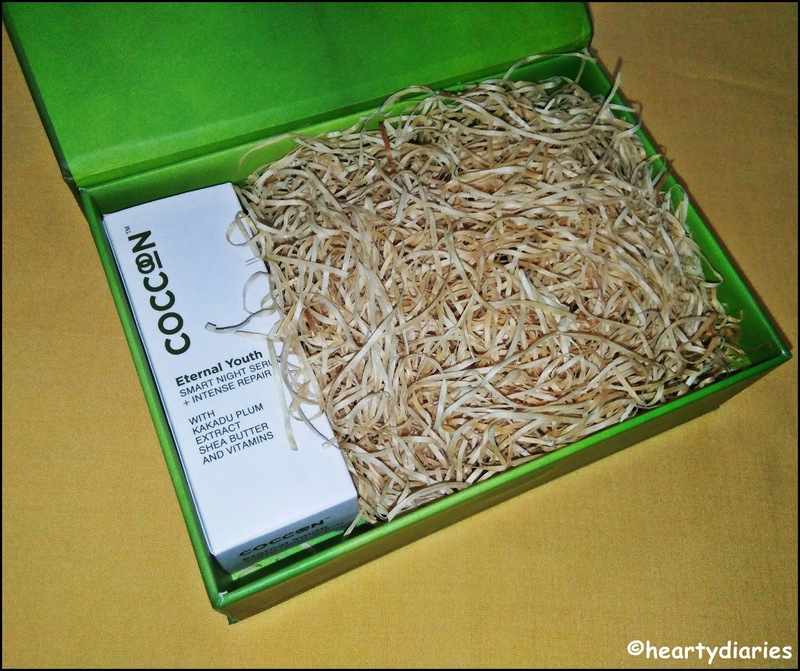 My thoughts: Now being a skincare enthusiast, this is the product I am most excited about. I love pampering my facial skin, deep cleaning it and making it look fresh and radiant. 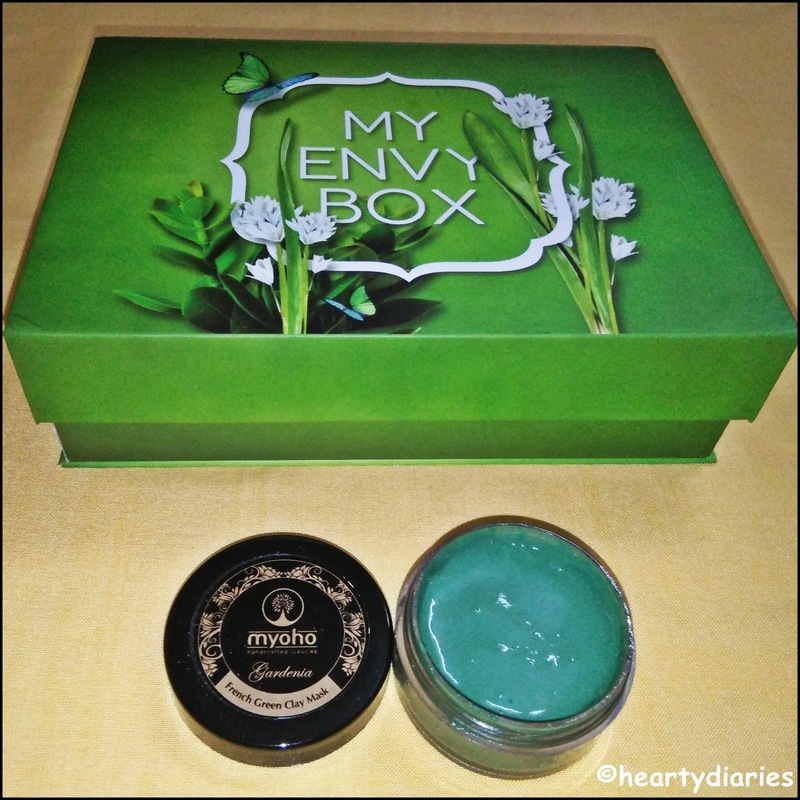 This is the first product I’ll be using and reviewing on my blog soon because it excites me so freaking much! My thoughts: I’ve never heard a combination of coconut and mango and I can’t wait to open this pack up to see what it feels like. I am really imagining what the smell would be like.. Anyways, I’ll try this paraben free body lotion soon and tell you guys too.. Who doesn’t like having smooth and moisturised skin? My thoughts: I really love scrubs and exfoliators as they remove dead skin cells leaving our skin moisturised and supple. I currently have three really good and competitive scrubs in the market and I can’t wait to see if it beats them. This scrub is paraben free which makes me really happy to try it out. Since it is fragranced with grapefruit extract, I wish to smell it soon. I love floral and citrus scents! They’re just so pleasant plus..
My thoughts: I guess no one of you would know that I was photoallergic and I completely left going in the sun after a terrible allergy and sun burn which left me a Vitamin D deficient for one and a half year. Sun rays are really harmful for our skin and eyes and we should always take care while stepping out. My skin still reacts to sun if exposed for more than twenty minutes and this clinically tested and dermatologically approved cream is for me. I will buy the full sized one for sure. I am really happy with this month’s box and the overall quality. The brands are really luxurious and offer amazing skincare. I feel really lucky to have this month’s box because I’ve got a steal deal. I couldn’t have really bought these products individually but I got them in just Rs. 850 and I really love the fact that I came to know about the brands Iraa and Vert. I’ll try the products as soon as possible and will make sure to review each one of them. How can I not? I’ve got three full sized amazing products and three really great samples total worth Rs. 2409. If you’re a skincare person like me who wants to stay away from paraben and alcohol, I highly suggest you to buy this box.. You’re getting amazing cruelty free stuff in such a cute box that I can’t stop raving about in just Rs. 850. Make sure to check their website to find some amazing promo codes and discount offers. I would love to check it out.. Thanks for stopping by Alfiya.. ? All the products sound good!